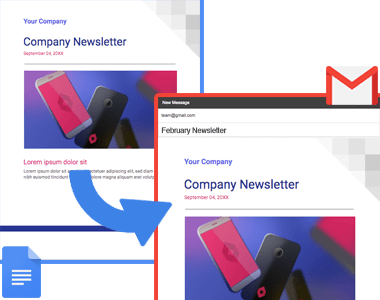 Design emails in Google Drive! Create beautiful emails by designing them in Google Docs. Design emails in Google Docs. Import them to Gmail with 1 click! Convert Google Docs to Gmail Drafts is fully integrated with Gmail. There is no need to use a third-party website and no software to download to your PC. Simply install the Chrome extension and get started! 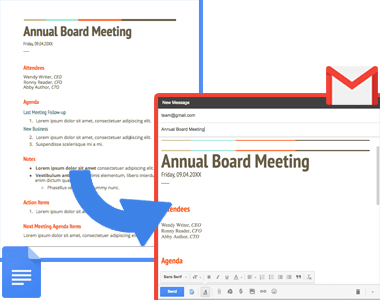 Convert Google Docs to Gmail Drafts lets you design emails—including images, graphics, charts, and content—in Google Docs. Once you’ve completed your email design, click one button and your message will be instantly converted to an email draft in Gmail. All formatting and content will be preserved. No HTML knowledge needed! Convert Google Docs to Gmail Drafts is 5-star rated from 100+ users who’ve downloaded it in Chrome. Convert Google Docs to Gmail Drafts installs in seconds from the Chrome Web Store. Once installed, the new functionality will be seamlessly embedded in Docs and your Gmail email account. 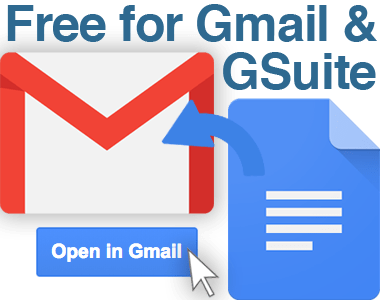 Convert Google Docs to Gmail Drafts is free and available for anyone using Gmail or a business email hosted by G Suite. Unlimited use is available for a few dollars a month. How Are People Like Me Using Convert Google Docs to Gmail Drafts? 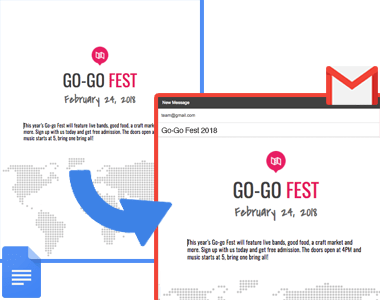 Convert Google Docs to Gmail drafts is a great way to create custom email designs for important messages in Gmail. Create a design in Docs, then import the message into Gmail with 1 click! Need a custom invite for a birthday or retirement party? Google Docs is a much easier tool than Gmail for custom designs. Have a company or non-profit newsletter? Make it look great by designing it in Google Docs, then importing it into Gmail with 1 click. It’s all 100% free using Convert Google Docs to Gmail from cloudHQ!